I bought a few of the spectrum markers because they were on a special at one of our stores. The price was $7.99 for 6 markers. I like the marker and they do work well but I think they should have at least made the end caps the color of the marker. I was very surprised to see a different color on the markers and the end caps. If any of you decide to purchase them it is a good idea to download the color chart from their web site. It will be much easier to use them. I was making this card for the Lacy Sunshine loyalty program. I printed my image and got the background ready when I realized It was Maddy shopping image. So back to getting the right image. The challenge this week is show us goth or and nontraditional hair color. I decided it would be fun to do both. I think she turned out super cute. I printed the image onto neenah cs on grey scale at 3.5 inches. I am using spellbinders hexagon backgrounds. I chalked the background of the image with bashful blue and yellow. I colored the image with spectrum noir markers. 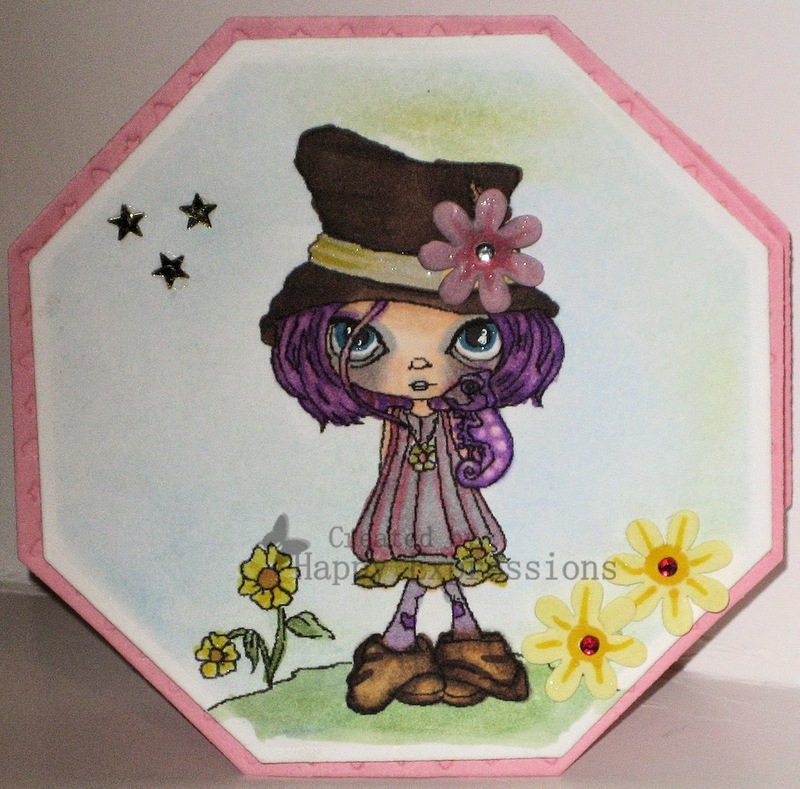 I then added some small flowers from my stash and added some grey to the pink flower in her hat and dark yellow on the flowers. I added wink of stella to all the flowers. Then to fill in the space on the left side I added a few of the sequin stars. I hope you like her try out the challenge. Thank you for stopping by, happy creating and have a fabulous day! Great card! Who doesn't love purple hair?! Thank you so much for playing along with us in our "Goth/Non-Traditional" challenge at Lacy Sunshine. We're so happy you joined us! Please visit us, again! ~~Sammibug~~ DT Member for Lacy Sunshine.